What happened? With the wisdom gained from the experience, Conner can now clearly identify where things went wrong. 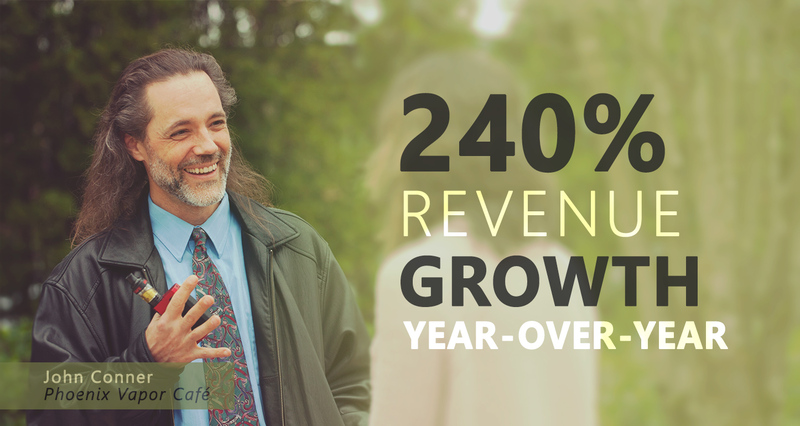 And with his company reset for growth he’s experiencing 240% year-over-year sales growth. Using a goal management software to keep everyone at his company aligned and engaged on the work that needed to be done he was able to get back on the growth track. We’ll dive more into that technology solution after we share Conner’s story. With sales scorching-hot at Phoenix Vapor Café, Conner’s flagship store in Olympia, Washington, everyone was telling him “you gotta keep growing.” This was in 2010 when vaping emerged as a major thing. In the next few years he opened eight more stores up and down the coast, including five in California. Who could blame him for stepping on the accelerator? “The business was exploding and thinking ‘how hard could this be?’ we expanded in all directions without really any structure,” Conner recalled. Another major motivator was that this business was a personal passion. He’d tried to stop smoking cigarettes for the better part of 30 years. In 2009 he discovered vaping and overnight he kicked cigarettes. He instantly felt better, his energy was up, aches and pains had disappeared, he could taste food again. Giving smokers an alternative to cigarettes became his mission – about 1,800 people in the U.S. reportedly die every day from smoking-related illnesses. In Conner’s mind this was a business with a social cause … and massive consumer demand. The future looked totally golden. But in 2012 things began to fall apart. His main supplier couldn’t keep up with demand. Loyal customers got ticked off when their favorite vape flavors weren’t available. Competitors emerged, chipping away at market share. Though he’d established managers at every store, many weren’t responsibly running operations. Employee theft became a problem, tax records weren’t adequately managed, expenses spiraled out of control, and a host of other issues seriously began to kill the buzz. Worse, sales started to tank. By 2012 everything had unraveled. Bankruptcy loomed and Conner was looking to salvage the valuable parts of the business he still believed in. In Olympia he met fellow business owner Rick Gifford, who was developing a software application that addressed many of the issues Conner had experienced. Conner began using an early version of Alliance’s goal achievement application, called MyObjectives. The app focused his efforts on writing company goals that everything in the future would hinge on. It brought clarity, and established needed discipline that allowed the company to reset. Phoenix Vapor Café is now repositioned for future growth. Conner consolidated operations into one retail shop and five employees at the original site in Olympia, and is focused on online sales. They diversified suppliers. Conner carries a precise profit and loss balance sheet that he can reference at any time to see how the company is operating. And the team is communicating better than ever. If problems do surface, they’re documented in MyObjectives and can be quickly talked about or resolved before blowing up into bigger issues. Or, even better, the team meetings center on more interesting conversations that truly energize them – things like their mission of helping people kick cigarettes and new ideas for doing it. As for sales, they’re up again. Over the past year revenue rose 240% at the Olympia store and a sharp focus is on growing web sales. They’re developing an online membership model that rewards customer loyalty and increasing education about the benefits of vaping vs. smoking.